While on another late night web hunt for unique mosaics, I found a project that really caught my eye. 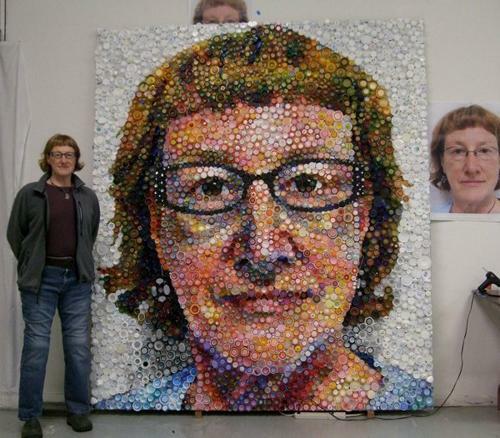 Chicago artist Mary Ellen Croteau has collected enough plastic bottle caps to arrange them into an 8'x7' mosaic self portrait. Except where the whiteboard was showing through, no paint was used during the mosaic process, nor was the source image superimposed on the backing board - we're looking at a true mosaic here! I was catching up with a friend from Montreal recently who told me about an interesting festival that was approaching. 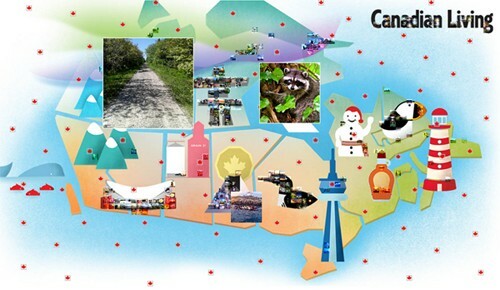 Apparently, throughout the weekend of August 16th-18th, Canadian Living Magazine is inviting Canadians nationwide to submit their photos to an online, streaming photo mosaic for their 2013 PhotoFest! Right away, I went to the website to explore as much as I could, and to my surprise I found out that this streaming mosaic concept was provided by Picture Mosaics, whom I've written about in the past. As soon as I woke up this morning, I went to the PhotoFest mosaic site and watched for a few minutes as photos were added to the mosaic in real-time, right before my eyes. I was amazed by how smoothly they each found their perfect place within the mosaic to create the bigger picture. I was even able to search by using a keyword, email, or hashtag and share individual photos through Facebook, Twitter, or Pinterest. And, one of the most exciting parts was the chance to win a prize if your photo lands on a cell with a maple leaf! I highly recommend giving this mosaic a visit. Now that the Canadian Living 2013 PhotoFest has come to a close, the beautiful finished photo mosaic is still accessible online. Check it out after the jump! I was recently at an event in Boston, MA hosted by United Way, and I saw something that really caught my eye and was perfect for this site. I noticed some sort of moving photo mosaic on a large, HD monitor with a green screen next to it. Upon further inspection, I found that you could have your photo taken on the spot and watch as your photo was added to the mosaic on the monitor. I wish I could say I was surprised when I approached the mosaic attendants only to find out that this real-time interactive mosaic was created and hosted by our friends at Picture Mosaics. Have you ever looked at a photo or a piece of art for what feels like an eternity? Your eyes continue to scan over it, there's something about it keeping you fixated, but your mind just can't seem to grasp its mystery? In my web-travels, I stumbled upon an article on PetaPixel featuring the work of Bela Borsodi, a New York-based photographer who has particularly framed this photo to yield very interesting results! 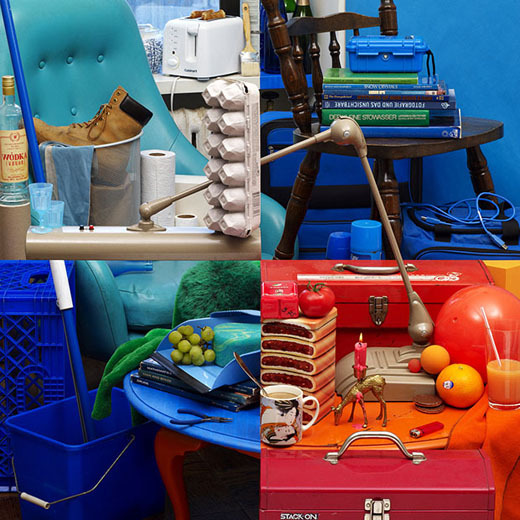 Not exactly a photo mosaic per se, but an interesting experiment in a similar vein. I won't spoil the secret for you, reveal the mystery for yourself by watching the video!! Once in a while something comes along and simply makes you speechless. If you have 2 minutes to spare, this is worth a quick watch. When nothing is on TV and I have exhausted my channel surfing abilities, I sometimes turn to YouTube and web my way deeper and deeper from one video to the next. Keeping on the theme of mosaics, I happened to stumble upon a video from one of my favorite shows: Mythbusters. It is from a few years back, but nevertheless still very cool! In a nutshell, hosts, Adam Savage and Jamie Hyneman, try to graphically demonstrate the difference between CPU and GPU by creating a paintball mosaic of Mona Lisa (I am still trying figure out the metaphor). The mosaic was painted in a very impressive 275 milliseconds using a one-of-a-kind 1100 barrel paint ball gun. Guinness Book of World Records Photo Mosaic! Since I wear glasses on a daily basis, I am definitely someone who would be lost in the world without my glasses! I've been a Transitions girl for 5 years now and I would never turn back! Having fanned them on Facebook, a recent post immediately caught my attention. 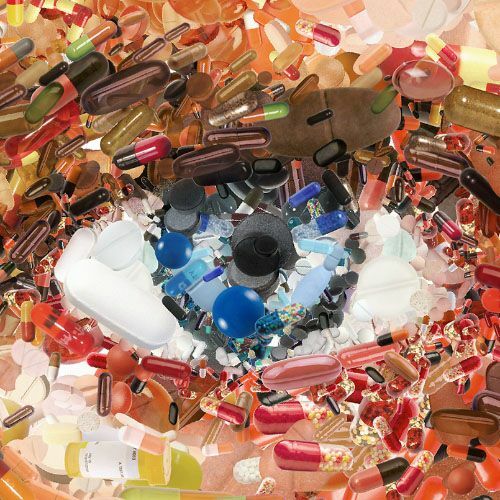 The post read, "In honor of World Sight Day, we present the largest photo mosaic in the world! We broke the Guinness Book of World Records!" 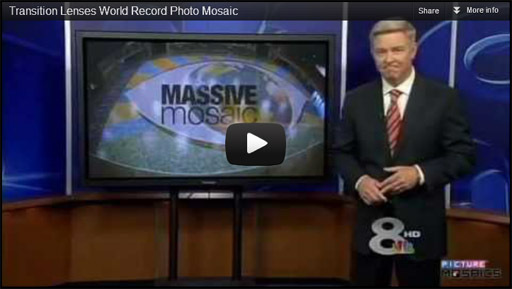 Read more: Guinness Book of World Records Photo Mosaic! A friend of mine on Facebook shared a link on my wall of the most adorable mosaic, the 2012 First Cheerios Mosaic ! 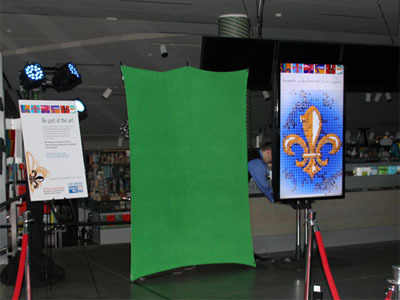 It is an interactive online mosaic reaching out to parents to be a part of a photographic monument. This is an excellent way for families to celebrate together one of their toddler's momentous "firsts"! 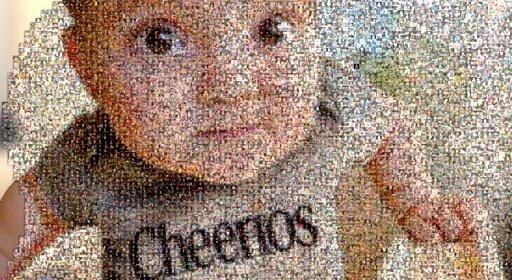 Not only is your child a part of this monumental online mosaic, you could even see your baby on a box of Cheerios! In Spring 2013, Cheerios will be unveiling the completed mosaic on limited-edition boxes of Cheerios. That's so cool!! This is such a cute, playful way to connect and share with other parents your child's First Cheerios. As a photographer and art enthusiast, I am always intrigued when I come upon an innovative art form or technique. I was looking at a sketching tutorial on YouTube recently and this video came up of an artist who creates portraits in one single pen stroke. Artist, Chan Hwee Chong recreated these famous portraits by precisely drawing one single line in a swirling motion. This isn't really a mosaic in any way but it was too cool not to share. You will see in the video (after the jump) Chong starts at the center of his canvas and calculatedly expands the first tiny swirl around and around until the portrait appears. This meticulous and mesmerizing technique is a genius advertisement for the pen Chong uses. 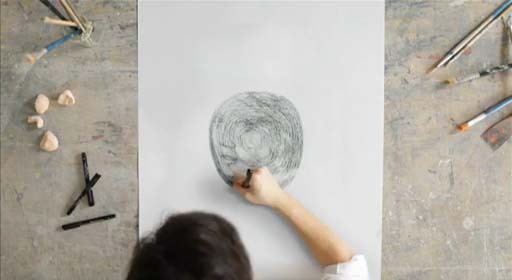 Faber Castell allows the product to speak for itself in this video. Attention all the cat lovers: here is a mosaic for you! I rarely pay attention to facebook ads, however surprisingly this one did catch my attention. Two cute kittens with the caption: "Save a life". 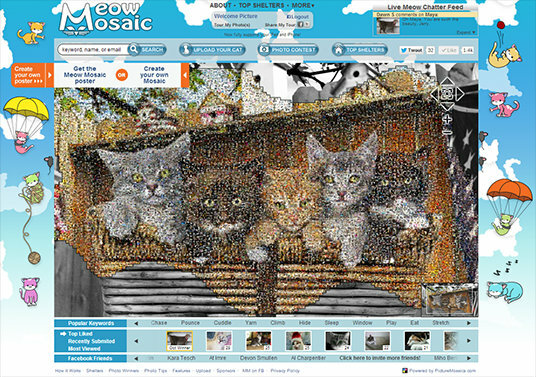 I love cats, so I clicked through and to my surprise, a mosaic, the Meow Mosaic! Read more: Attention all the cat lovers: here is a mosaic for you!